But Rivera wasn’t fazed by the grunt work. “I came back the following summer and worked for them again,” he said. Since then, Rivera earned his law degree from Georgetown University, joined the Florida Bar and became a shareholder at Siegfried Rivera in Plantation. But it was at the law firm in Miami’s Coconut Grove where it all began. It was there, he said, that he made his career decision. And he loved real estate, especially in South Florida. He combined his passions to specialize in real estate law. Perhaps it’s no surprise he considers his crowning career achievement to be his work on behalf of the developer of Mary Brickell Village in Miami’s Brickell district. Bar Invest Group Inc. and Constructa U.S. Inc. partnered to build the retail center and finished it in 2005. Already at Siegfried Rivera, Rivera was part of the team that represented the developer on the construction, in lease negotiations and in its subsequent sale, he said. “To have started doing grunt work and chopping up carbon paper … if you want to talk about a crowning achievement, I think getting involved in that project and seeing it from infancy to completion to sale is very fulfilling,” Rivera said. It’s fulfilling in part because Mary Brickell Village was the project that breathed life beyond the workday into the Brickell neighborhood, he added. “I think Mary Brickell Village basically reshaped the retail landscape in the Brickell area,” Rivera said. In between the highs, like representing Mary Brickell Village’s developer, and the lows, like doing the grunt work, Rivera has worked on numerous other deals, including lease talks for Benetton Group stores when the Italian fashion company expanded to Florida in the early 1980s. “We did a lot of Benetton lease negotiations throughout Florida and helped other operators throughout the Southeast open Benetton stores, and that led me to get other clients in the retail sector, and then eventually we started also doing work for the landlord side,” Rivera said. It was at around that time when he got involved with the International Council of Shopping Centers, a trade association. “I saw the value of how much that trade association really helped the business community, so I have been involved at every level: on the governmental side for many years, in planning and organizing the U.S. shopping Center law conference,” Rivera said. He still is involved with the organization, all on a volunteer basis. Last Thursday, Rivera spoke before the Congressional Hispanic Caucus in Washington at the request of the council. Rivera also volunteered outside real estate law for the Kiwanis Club of Little Havana from 1984 to 2010, helping run concerts and pageants and serving on the board of directors. 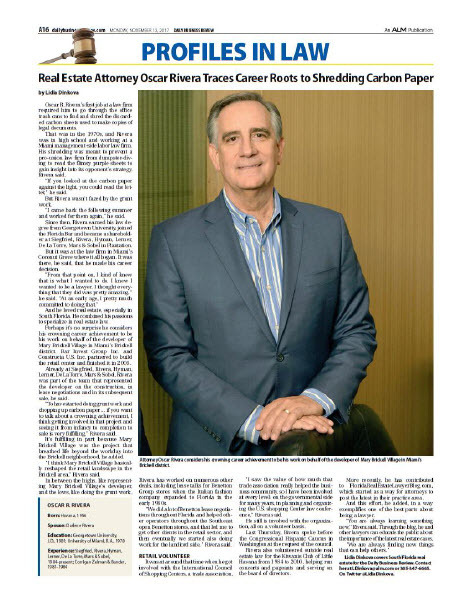 Our firm salutes Oscar for his significant contributions to the legal profession and real estate industry in South Florida that were chronicled in today’s Daily Business Review. Click here to read the complete article in the newspaper’s website (registration required).